The serial-based adventure-action film, set in 1936, opened with a thrilling, action-packed sequence - the American hero Dr. Indiana "Indy" Jones (Harrison Ford) was in a South American rainforest jungle on an expedition with two Spanish Peruvians: traitorous Satipo (Alfred Molina) and Barranca (Vic Tablian) as guides, to find a hidden temple (with an artifact treasure) within a cave. After entering, they set off various booby traps (a poisoned dart) and a spiked gate revealed the corpse of a previous dead explorer victim named Forrestal. Inside was a small altar with a tiny golden idol that Indy retrieved, but its retrieval triggered further traps, including an opening floor. Indy eventually escaped from the cave (after being chased by a huge boulder), but Satipo lost his life after betraying Indy. At the mouth of the cave, arch-rival French archaeologist René Belloq (Paul Freeman) took the idol, as Indy escaped to an awaiting seaplane, where he expressed his life-long fear of snakes. In the next scene, archaeology professor Dr. Jones was lecturing to students at a university. Marcus Brody (Denholm Elliott), the curator of the National Museum in Washington, informed Indy that US Army Intelligence agents were there to enlist him for another mission-search, to compete against Nazi leader Adolph Hitler in finding the lost Ark of the Covenant ("An army which carries the Ark before it is invincible"). Years earlier, Indy had served as understudy for Professor Ravenwood at the University of Chicago. Jones knew of his unsuccessful search to uncover the Ark - to find a brass medallion-headpiece for the top of the staff of Ra which would pinpoint, in the map room in Tanis (in Egypt), the exact location of the Well of Souls - the Ark's final resting place. He had also had a relationship with Ravenwood's daughter Marion (Karen Allen). To find Marion (and then her father), Jones boarded a Pan American clipper sea plane for a flight westward over the Pacific from San Francisco to Hawaii, Wake Island, the Philippine Islands, and then to his final destination - Nepal. On his plane tracking him was evil Gestapo Major Arnold Toht (Ronald Lacey). The film's heroine, Jones' feisty ex-lover Marion was located in a Nepalese saloon, where he was first belted in the mouth for leaving her ten years earlier. He learned that Ravenwood was dead, and that Marion possessed the medallion. When Indy left to return the next day, she was confronted by Toht who also wanted the medallion. Indy came to her rescue with his trademark bullwhip and fought off Toht, but the saloon was set ablaze. Toht grabbed at the brass medallion heated up in the fire - and scarred his hand with its indelible impression. In Cairo, Indy and Marion met with bearded Egyptian excavator Sallah (John Rhys-Davies), where they learned that the Germans were digging near the ancient Egyptian city of Tanis and had already found the map room. The pair were continually assaulted and tracked by the Nazis and other Arabs, in exciting chase sequences. Eventually, Marion was kidnapped, although Indy believed she had died in a truck explosion. Afterwards, Indy met German agent Belloq in an Arab bar, where the determined competitor told him: "It's a transmitter. It's a radio for speaking to God." Later, Indy also learned that the Nazis had obtained a copy of the medallion from Toht's burned hand, but their calculations about the location of the Well of Souls were slightly off and misleading. Disguised as an Arab, Indy infiltrated the Tanis site and entered undetected into the map room. With a beam of light shining through the medallion on the top of the staff, he determined the location of the Well of Souls in a miniature replica of the lost city built on the stone floor. With Sallah, the two sought out the location, and discovered Marion held in a Nazi tent as a captive. Refusing to rescue her so that their presence would be undetected, they continued on to the Well of Souls location, where they found an opening into the asp-ridden chamber underground ("Snakes. Why'd it hafta be snakes?"). Meanwhile, Belloq attempted to bribe Marion with a white dress, and her attempt to escape by getting Belloq drunk was thwarted when Toht appeared. In the underground chamber, Sallah and Indy removed the top of the large protective stone chest that enclosed the Lost Ark. They lifted the beautiful, rectangular-shaped, gold-overlaid Ark clear of its stone chest, into a wooden crate, and out of the chamber to the surface - where they were confronted and captured by the Nazis. Toht pushed Marion into the hole to be sealed inside the Well of Souls with Indy. Although their plight seemed hopeless, Indy figured that the secret chamber was probably connected to other chambers already excavated by the Nazis. He crashed a tall statue into the wall, revealing more catacombs that led to the outside. They emerged in sight of the Flying Wing airplane with twirling propellers that would soon carry the Ark to Hitler. After fighting off a mechanic and a burly, bald opponent (who met his demise in the propellers), Indy destroyed the plane in a massive fireball. The Nazis planned to load the Ark onto a canvas-topped truck bound for Cairo and then by plane to Berlin. Indy instructed Sallah: "Get back to Cairo. Get us some transport to England. Boat, plane, anything. Meet me at Omar's. Be ready for me. I'm going after that truck." In one of filmdom's most exciting sequences, Indy pursued the truck on horseback, subdued the truck driver and various other Nazis, and drove the truck into Cairo - where Sallah was awaiting his arrival. A trustworthy, black ship captain named Mr. Katanga (George Harris) had been commissioned by Sallah at the Cairo waterfront docks to take the wounded Jones and Marion (and the Ark in the cargo hold) in an old tramp steamer named the Bantu Wind to England. During their journey, a wounded Indy and Marion experienced a love scene together. Their ship was apprehended by a Nazi submarine - the Germans repossessed the Ark and seized Marion. Indy outwitted the Nazis by riding on the top of the vessel, bound for a mysterious island in the middle of the Aegean Sea. Before sending the Ark to Hitler, Belloq explained to the uncomfortable German commandant that it must first be opened in a preliminary ceremony on a secluded part of the island, setting up the final climactic scene. Indy confronted the Nazis and threatened to blow up the Ark, but rather than risk Marion's life once more, he lowered his bazooka and surrendered to them. Indy and Marion were tied back-to-back to a stake, and watched from a few hundred feet away as the Ark was ceremonially brought into a small grotto or crevice of rocks. When the Ark (a Pandora's Box) was opened, Belloq discovered only dust inside - and the blinding light of the Ark conjured up hideous ghostly images. Piercing bolts of fiery lightning struck the Nazis in attendance, and faces melted and exploded. Indy and Marion were saved by not looking. After the scene of holocaust-like devastation, fire shot out of the Ark toward the heavens, and then reversed itself - and the Ark cover was firmly shut. In the final short scene (reminiscent of Citizen Kane (1941)), a warehouse worker pushed the crated Ark (marked "TOP SECRET, ARMY INTEL 9906753 DO NOT OPEN!") down an aisle in an enormous government warehouse, to be hidden away for permanent storage. Great Scene(s): the thrilling opening with a runaway boulder, an underground Egyptian temple filled with snakes, multiple tense chase scenes, and the fiery finale when the rival, religious artifact-obsessed French archaeologist and his Third Reich Nazi cohorts opened the Ark of the Covenant and supernatural forces were unleashed upon them as retribution. 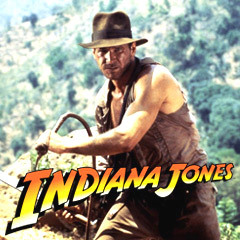 This exciting adventure-fantasy film introduced the character of whip-carrying Indy Jones (Harrison Ford). With a production budget of approximately $23 million, the film grossed $242 million (domestic) and $384 million (worldwide). With eight Oscar nominations and four wins: Best Art Direction-Set Decoration, Best Sound, Best Film Editing, and Best Visual Effects, plus a Special Achievement Award for Sound Effects Editing. Its unrewarded nominations were: Best Picture, Best Director, Best Cinematography (Douglas Slocombe), and Best Original Score (John Williams). The main religious artifact: The Jewish Ark of the Covenant that once held the Ten Commandments.